Kentucky Sen. Rand Paul, declaring “we have come to take our country back,” formally announced his candidacy Tuesday for the Republican nomination for president. 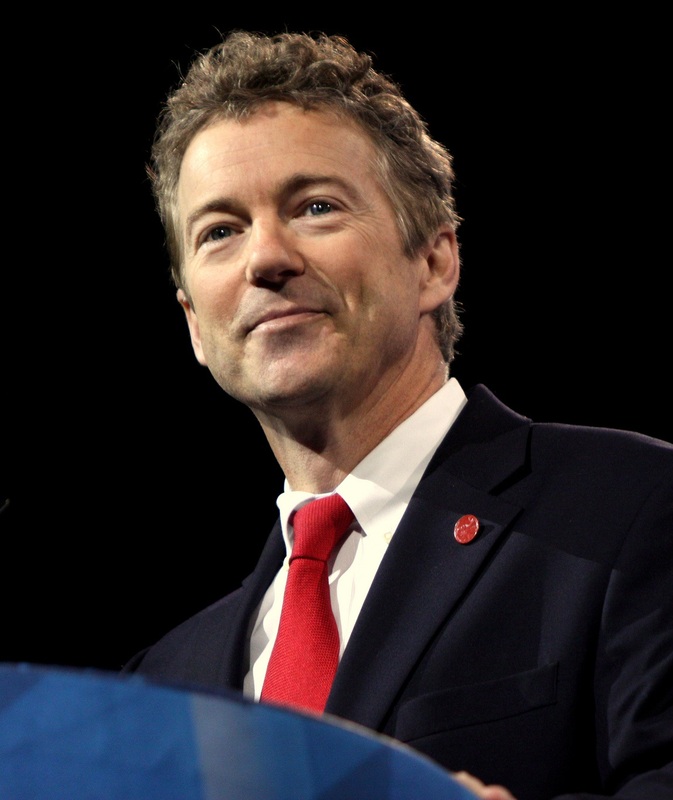 “Today I am announcing, with God’s help and with liberty lovers everywhere, that I am putting myself forward as a candidate for president of the United States,” the 52-year-old Paul said at his “Stand for Rand” rally in Louisville, a few hours after making the announcement on RandPaul.com. The roughly 30-minute program before Paul’s announcement included a cross-section of Americans, in an apparent effort to broaden his conservative base. Among those on stage were female University of Kentucky student Lauren Bosler and former Oklahoma GOP Rep. J.C. Watts, who is black. The program also included several videos that highlighted Paul’s effort to reach out to members of the African American community, including events at historically black colleges. They also showed him providing eyes exams and surgeries in Third World countries. A Tea Party favorite and frequent antagonist of leaders of his Republican Party, Paul is expected to head out after the rally to early nominating states with a pitch aimed at the libertarian corners of the GOP. He is the second announced candidate, following closely behind Sen. Ted Cruz of Texas, but he could face as many as 20 rivals for the nomination before the lead-off Iowa caucuses early next year. Democrats responded to Paul’s announcement within minutes of his online announcement. Paul joined the Senate in 2011 after the Tea Party wave that also helped Republicans take control of the House for the first time in roughly 40 years. While at times a gadfly to party leadership, he’s also positioned himself as slightly more mainstream than his father, former Texas GOP Rep. Ron Paul. While his father proudly embraces anti-interventionist views, the younger Paul has denied claims that he’s an isolationist on the world stage. At a time of Islamic State and other terror threats, Paul may have to fight to prove his national security credentials — particularly as other Republicans suggest he’s not tough enough. Paul nevertheless has risen to national prominence, in large part because of his outspoken opposition to government surveillance and overspending, including the high cost of imprisoning Americans under mandatory-minimum drug sentencing. In a speech that essentially followed what Paul has argued since arriving to Washington, he was critical of the federal government monitoring Americans’ phone and online activities and giving financial support to foreign countries that harbor terrorists. He also called for a stop to terror groups such as the Islamic State. Paul vowed to stop the National Security Agency’s surveillance program on “day one” of his presidency, if elected. He also said Congress “must” have final approval on the Iran nuclear deal and called for the passage of a balanced-budget amendment to keep the federal government from spending more than it brings in. Paul attended Duke University School of Medicine and owned an ophthalmology practice in Bowling Green, Ky., where he and his wife make their home. They have three boys — William, 21, Duncan, 18, and Robert 15. He is the third of five children and grew up in Lake Jackson, Texas. He attended Baylor University before going to Duke. Paul completed a general surgery internship at Georgia Baptist Medical Center, in Atlanta, then returned to Duke to complete his residency in ophthalmology. He was a volunteer coach for his sons’ youth sports teams, remains active in such groups as Lions Clubs International and continues to provide free eye exams and surgery for patients across Kentucky and to children around the world. As Kentucky’s junior senator, Paul is a member of the chamber’s Foreign Relations; Health, Education, Labor and Pensions; Homeland Security and Government Affairs; and Small Business and Entrepreneurship committees. Beyond seeking support from conservatives, independents and libertarians, Paul also plans to get the backing of those who might not necessarily think a Republican deserves their vote. With first Ted Cruz and now Rand Paul, let the fun begin! Brace yourself for the mainstream media to label him as throw back republican with a platform of “failed” policies. Don’t buy into the media BS with a clear liberal supported and funded message.